3" x 4" Glossy Basic Gospel Message Card complement Salvation Bracelets as they explain the bead color meanings as they apply to God's Plan of Salvation for Salvation Bracelets, Salvation Silicone Wristbands, and Salvation Key Rings / Zipper Pulls. Prayer of Salvation on Reverse. 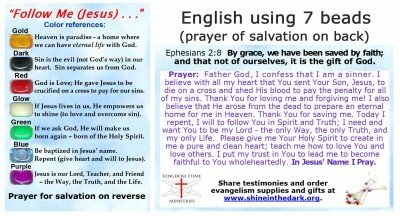 Click on following Language Link to view enlarged Message Card: English using 7 Colors, English using 6 Colors, English using 5 Colors, Arabic, Cambodian (Khmer), Haitian Creole, Japanese, Korean, Portuguese, Romanian, Russian, Spanish, Swahili, Zulu. 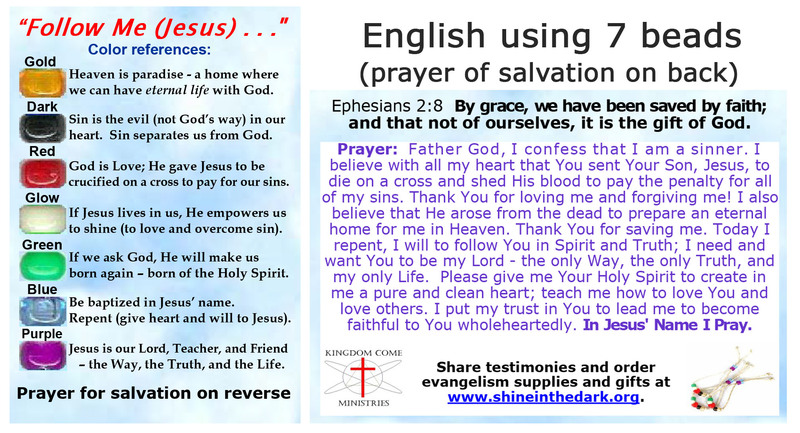 Message Cards for Evangelism Salvation Tools using only 5 or 6 Colors are available only in English. You might consider 3" x 4" Plastic Zip Lock Baggies if you are making Salvation Bracelet Craft Kits or Salvation Bracelet Gift Bags. Gold = Heaven is paradise - a home where we can have eternal life with God. Dark = Sin is the evil (not God's way) in our heart. Sin separates us from God. Red = God is Love; He gave Jesus to be crucified on a cross to pay for our sins. Glow White = If Jesus lives in us, He empowers us to shine ( to love and overcome sin). Green = If we ask God, He will make us born again -born of the Holy Spirit. Blue = Be baptized in Jesus' name. Repent (give heart and will to Jesus). Purple = Jesus is our Lord, Teacher, and Friend - the Way, the Truth, and the Life. Ephesians 2:8 By grace, we have been saved by faith; and that not of ourselves, it is the gift of God.